Visionaries is an introduction to avant-garde film. Ostensibly about Jonas Mekas, Visionaries uses Mekas as the glue that hold together the various artists who made experimental and films in the last century. 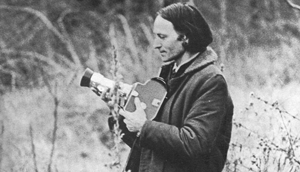 Mekas, a film artist in his own right, is also one of the most important advocates for art film. I was fortunate enough to have attended several classes taught by Stan Brakhage (and by others influenced by experimental filmmakers such as Don Yannacito). Most of the artists and half of the films presented in Visionaries were familiar to me. It was a joy to see them again, and to be reminded of the stories behind the art. I was intrigued by the artists and works I wasn’t familiar with. Piece by piece, Visionaries is an interesting documentary. Each scene and subject is presented with a nice mix of the artist, the work, and the motive or meaning behind the work. But as a whole, this documentary feels rough and padded. It needs more focus and more tightening (I did see an unfinished cut so maybe this won’t be an issue at the festival). There’s not an overall story arc. There is structure; the film keeps coming back to Mekas and his influence as an advocate for experimental film. But there is not enough contrast or cohesion in Visionaries to make the movie itself feel like a larger work. Visionaries may not be for everyone. It’s refreshing to see Ken Jacobs (or was it Mekas) acknowledge that art film has a very small audience. Nobody in the documentary bemoans the state of American culture, pretending that the average moviegoer impressed by 2012, for example, would know what to do with Mothlight or Meshes of the Afternoon. This movie does have value, though as an overview to avant-garde cinema. If you’re the kind of person who goes to film festivals, chances are you might be open to film as art, film that doesn’t follow convention. So if you’re feeling adventurous, give Visionaries a chance — if not because it’s a great documentary, then because it’s a great subject matter. And afterwards, come to First Person Cinema in Boulder on the CU Campus, or to the Brakahage salons hosted monthly at CU to see these films first-hand.